I remember when I was younger, we found a stray kitten and decided to keep him in our house. We only had him for a few days since my parents didn’t want us to keep him. Both my mom and dad were worried that we might get a pet allergy. I think it was because my brother or sister started sneezing a lot since we had the cat. That was 15 years ago. Then, a few more years later, we haven’t had any dogs or cats in the house until 2010. When I had my own place, I felt like it was finally time for me to get a pet. When I started my blog, I initially thought I should make a category for Dogs. I don’t know what I wanted to write, really, but now it’s time for you to meet my pets. 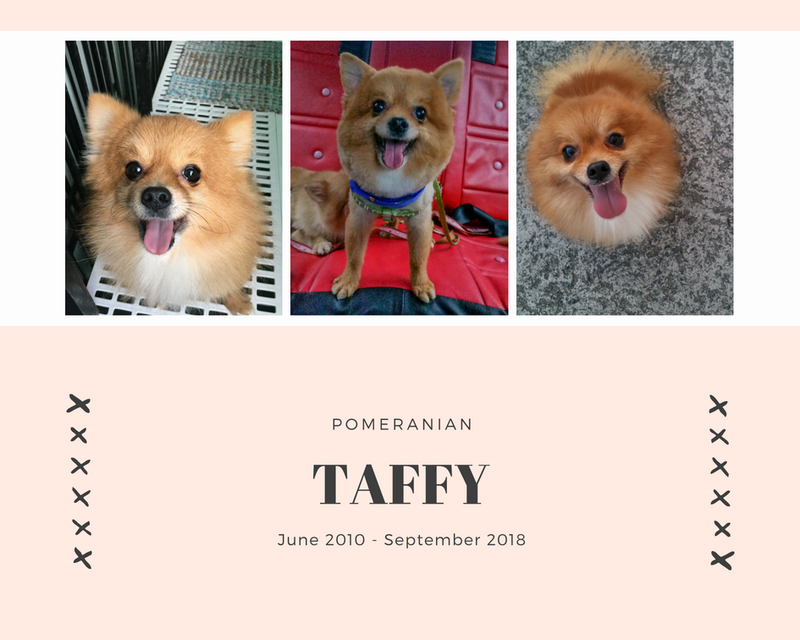 Meet my first ever Pomeranian, Taffy. He’s such a cute furball. I always feel a lot better every time I see him smile. He may be the oldest among my two other Pomeranians, but he’s the smallest. Taffy loves to walk off-leash. He’s the only pet that I’m comfortable letting off-leash. I love how even though he wanders around a lot, he panics whenever he doesn’t see me. So, I usually see him come running towards me. He is not comfortable sitting on someone’s lap, or anything that’s not a hard surface. But, he loves being near people, petting him. A few months ago, he had a skin infection. Almost weekly trips to the vet, we thought he’ll get better soon. Besides, he is only 8 years old. Pomeranians are supposed to live until 12 - 16 years. He has a few more years left. But, he didn’t make it. I got her in 2011, a year after Taffy. She is the loudest dog ever, but the sweetest. You’ll often see her sitting on my lap or anyone’s lap. She loves to be near people. I cannot remember how often I had a hard time with her because she’s too loud. Almost every little thing, she’ll bark at it. 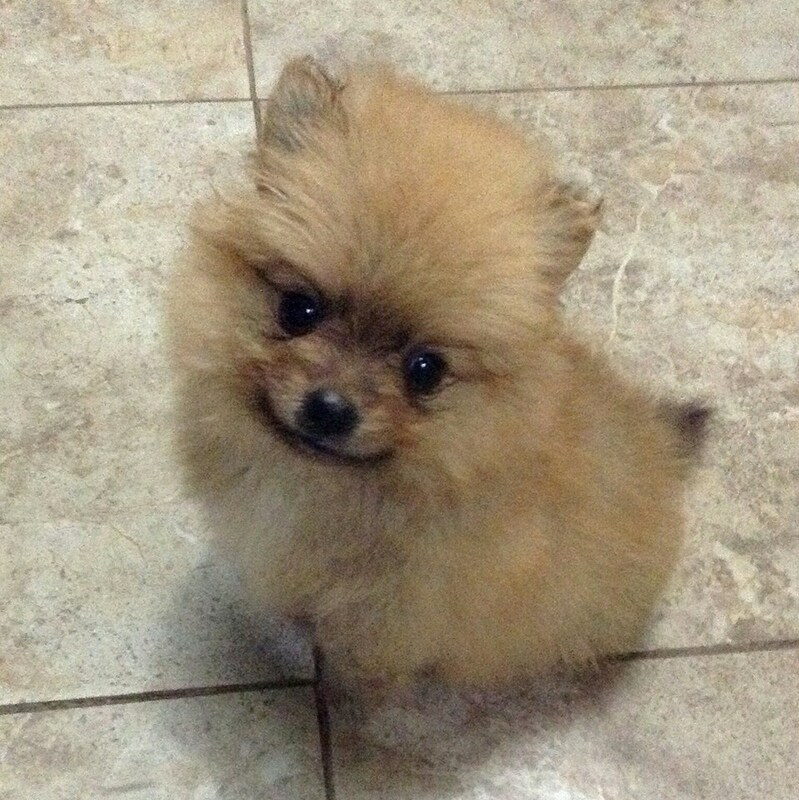 I know Pomeranians are really yappy, but she’s different. I still love here, though! When I was home, I love seeing her play with our other dogs. But, whenever I sit on the floor, she’ll run towards me and sit on my lap. She doesn’t choose people. As long as you’ll pet her or call her name, she’ll come and stay with you. Fifi loves to eat. A lot. Compared to Taffy, Fifi is the one who is always sick. I (or my parents) often had to bring her to the vet because she’s not always feeling well. In 2014, Taffy and Fifi had their first puppies. Aren’t they the cutest? I cannot keep all of them, unfortunately, so I sold the three other puppies. I decided to keep the runt in the litter. Aica is the runt in the litter. I thought that she’s going to die so I gave her most of my attention until she got better. That’s when I fell in love with her and decided to keep her. Look at her smile! Who could resist that? This is my most favorite photo of Aica. I’ll always remember how weak she was, but she made it! Now, meet our Siberian Husky, Yumi! I said “our” because Yumi is my and my ex-boyfriend’s pet. We got her when we were together, and I still visit her from time to time when I was in the Philippines. Just last year, Yumi went missing because someone forgot to lock the gate in my ex-boyfriend’s place so she got out. We had some issues getting her back because the person who found her kept her & didn’t want to give her back. Thankfully, we met some good people who told us where to find the person who got her. We were asked to pay before we can get her, though! How rude! I guess having some troubles is part of having dogs. I hope you loved my pets! My parents are taking care of Fifi now. I gave Aica to my boyfriend, Miguel. And Yumi is still living with my ex-boyfriend. I’m glad that everybody is healthy, and there are no complications. I wish for them to be healthier and live a longer life. I definitely miss Taffy. It breaks my heart that he’s gone too soon, but I’m happy at the same time since he no longer has to suffer.